THE smell of Peranakan and Asian cuisine wafting in from the kitchen at D’Cuisine makes one feel at home instantly. 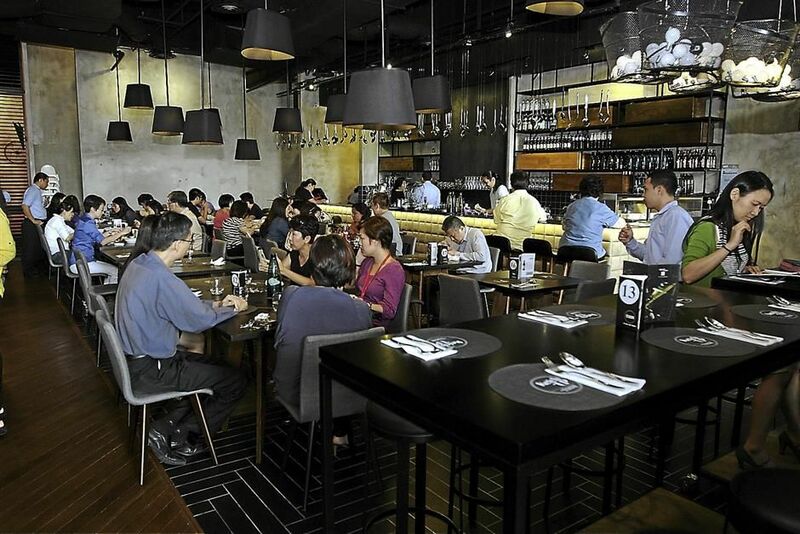 The concept restaurant by D’italiane Group at Jaya 33 serves traditional dishes with a twist. Owner K.H Saw said he wanted to explore creative cuisine options, in addition to what is offered at D?italiane restaurant in Jaya 33. “All our dishes are traditional but have been re-tooled to suit the ambience here,” he said. Local Chinese favourites have been turned into a delectable starter called Oriental Tapas platter. The Oriental Tapas platter has three dishes – Chilli Prawns, Mongolian Chicken and Wet Butter Fish served with homemade toasted Man Tou slices. It comes in dainty portions for easy dining. The crispy man tou goes well with the spicy prawns, or the sweet and sour Mongolian Chicken while the salted eggs from the Butter Fish is also a good pairing. Another must-try appetiser is the Mongolian Duck where the juicy boneless duck is smoked and pan fried. It is served with Mongolian sauce that is a little peppery, sweet and sour all at once. The Scallop Medusa is made from scallop, seafood paste, vegetables and covered with crispy fried strings to look like the Greek mythological creature with snakes in place of hair. For the main course, there is the Fish Casserole made with Garoupa Fillet, spices and aromatic lemongrass in a hot pot. “The hot pot infuses the flavours better,” said Saw. The D’Cuisine Peranakan platter is a perfect replica of Malaysian Peranakan cuisine, with assam prawns and deep fried chicken. Saw said the deep-fried chicken is specially marinated overnight with herbs and spices to bring out the flavours of the meat. The chicken and prawns are served with aromatic coconut Thai rice, vegetables and garnished with cucumber and tomato slices. A house speciality is the Sang Har noodles, a dish that should be eaten piping hot to enjoy the juicy large prawns served with it. “The trick to perfecting this dish is in its timing and infusing the river prawn roe into the sauce,” he added. Traditional Chinese dishes such as the Tea Smoked Chicken are hard to find in most restaurants these days. Saw has ensured the Pu Er double-infused chicken and butterfly pea rice is up to the mark. There are also a number of western selections for diners such as the Baked Cod with Orange Ginger Sauce which is bursting with citrus flavours as well as the Lamb Cutlets with Mongolian Sauce. For dessert, try the refreshing Lemongrass Ice Cream Parfait, with home-made ice cream, the Molten Salted Egg Pudding with home-made vanilla ice cream or its twin, the Molten Black Sesame Pudding with home-made vanilla ice cream. The restaurant also serves one-of-a-kind cocktails such as the Sake Ria with Japanese wine and peach puree, the Spicy Scotch Pears that ooze sweetness with a hint of spice as well as the Mad Sailor that has a tropical kick to it.